An engagement proposal is something many ladies dream about, but it’s also something that can be painstaking for her husband-to-be. How much should I spend? Does she like round or princess cut? These are all questions the prospective groom must face as he starts shopping for the ring. According to the 2011 Engagement & Jewelry Statistics recently released by TheKnot.com and WeddingChannel.com, the average groom takes nearly 3 months to find the perfect ring! These wedding sites collected data from more than 10,000 qualified brides and grooms from the U.S. As a newly married lady myself, I found some of these statistics especially interesting. One key trend the stats revealed is a new sector of engaged couples known as “luxury ring” buyers. About 12% of the couples surveyed fell into this segment, which meant they spent more than $8,000 on the engagement ring. The average cost of a luxury ring was $13,500 (!) 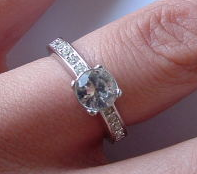 and included 1.5 carats for the center stone and more than 2 carats of total stones on the ring. The average cost of a non-luxury ring was $5,200, which is still pretty pricey! Because the design of the ring and the cut of the stone are perhaps the most important things to the bride (and the most challenging things to get right for the groom), I found it noteworthy that the article pointed to round cut diamonds as the “favorite” among both luxury and non-luxury engagement ring couples. I thought it might be fun to use Minitab to determine whether the preference for round cut diamonds is just as strong in non-luxury brides as it is in luxury brides. This contingency table tallies responses according to “bride type” and preference for cut. I included marginal totals for each level of the variables in my table. The marginal totals for the rows show that 8,800 of the survey respondents were non-luxury ring buyers. Marginal totals for the columns revealed 5,348 of all respondents prefer round cut diamonds. The grand total shows 10,000 brides and grooms were surveyed. To reveal associations between the two variables (bride type and cut), I performed a chi-square test to determine whether the observed counts differ significantly from the expected counts under the null hypothesis of no association. 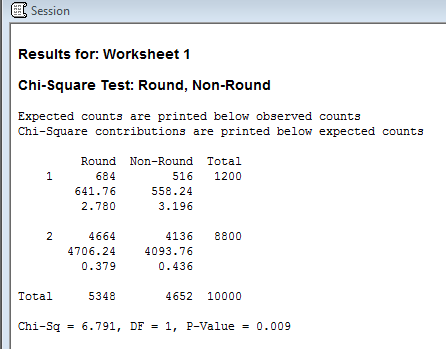 In Minitab, I chose Stat > Tables > Chi-Square Test (Two-Way Table in Worksheet). With a p-value less than 0.05, we can say there’s an association between bride type and stone preference—and affirm that luxury brides have a greater preference for round cut stones. Chi-square tests work best with large sample sizes, but if you have a smaller sample size—consider using Fisher’s exact test, which will also help you determine an association between variables. In Minitab, I chose Stat > Tables > Cross Tabulation and Chi-Square (making sure to check the box ‘Fisher’s exact test for 2x2 tables’ in the ‘Other Statistics’ option). 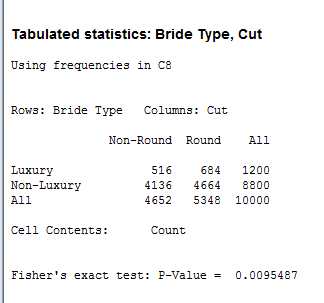 As you can see, Fisher’s exact test yields an almost identical p-value, which reveals there is evidence to suggest a bride’s luxury ring status will affect her preference in stone cut.